Robin Youngs, Edward Fisher,	The Journal of Laryngology & Otology, Volume 128 Issue 11, p 941. T J Ow, K Upadhyay, T J Belbin, M B Prystowsky, H Ostrer, R V Smith,	The Journal of Laryngology & Otology, Volume 128 Issue 10, pp 848-858. D Hamilton, C Hulme, L Flood, S Powell,	The Journal of Laryngology & Otology, Volume 128 Issue 2, pp 112-118. T J Ow, K Upadhyay, T J Belbin, M B Prystowsky, H Ostrer, R V Smith,	The Journal of Laryngology & Otology, Volume 128 Issue 11, pp 942-947. A C McGarvey, G R Hoffman, P G Osmotherly, P E Chiarelli,	The Journal of Laryngology & Otology, Volume 128 Issue 9, pp 746-751. Tranexamic acid – a useful drug in ENT surgery? P J Robb,	The Journal of Laryngology & Otology, Volume 128 Issue 7, pp 574-579. S Aval, L Pabla, L M Flood,	The Journal of Laryngology & Otology, Volume 128 Issue 1, pp 2-12. F Stelma, M F Bhutta,	The Journal of Laryngology & Otology, Volume 128 Issue 1, pp 13-21. A E L McMurran, I Khan, S Mohamad, M Shakeel, H Kubba,	The Journal of Laryngology & Otology, Volume 128 Issue 11, pp 948-951. V Veer, L Jackson, N Kara, M Hawthorne,	The Journal of Laryngology & Otology, Volume 128 Issue 1, pp 22-28. D J Pender,	The Journal of Laryngology & Otology, Volume 128 Issue 10, pp 859-865. Ö Sakallioğlu, I Adadan Güvenç, C Cingi,	The Journal of Laryngology & Otology, Volume 128 Issue 7, pp 580-585. P Hill-Feltham, S A Roberts, R Gladdis,	The Journal of Laryngology & Otology, Volume 128 Issue 2, pp 119-127. C E E Reddy, H G Lewis-Jones, M Javadpour, I Ryland, T H J Lesser,	The Journal of Laryngology & Otology, Volume 128 Issue 9, pp 752-758. M Chenebaux, E Lescanne, A Robier, S Kim, D Bakhos,	The Journal of Laryngology & Otology, Volume 128 Issue 7, pp 586-590. R E Redfern, M Brown, A G Benson,	The Journal of Laryngology & Otology, Volume 128 Issue 9, pp 759-764. M Lüscher, S Theilgaard, B Edholm,	The Journal of Laryngology & Otology, Volume 128 Issue 2, pp 128-133. H J Theunisse, J J Mulder, R J E Pennings, H P M Kunst, E A M Mylanus,	The Journal of Laryngology & Otology, Volume 128 Issue 11, pp 952-957. Z Yu, L Zhang, D Han,	The Journal of Laryngology & Otology, Volume 128 Issue 10, pp 866-870. J Lorente, F Sabater, M P Rivas, J Fuste, J Risco, M Gómez,	The Journal of Laryngology & Otology, Volume 128 Issue 7, pp 591-598. O Johnson, B Andrew, D Walker, S Morgan, A Aldren,	The Journal of Laryngology & Otology, Volume 128 Issue 1, pp 29-34. J D Whittaker, T Robinson, A Acharya, D Singh, M Smith,	The Journal of Laryngology & Otology, Volume 128 Issue 10, pp 871-880. M Whittaker, A Mathew, R Kanani, R G Kanegaonkar,	The Journal of Laryngology & Otology, Volume 128 Issue 11, pp 958-960. H-H Huang, C-H Chen, S-C Huang, C-H Yang, C-F Hwang,	The Journal of Laryngology & Otology, Volume 128 Issue 2, pp 134-141. A A Peyvandi, A Jamilian, E Moradi,	The Journal of Laryngology & Otology, Volume 128 Issue 9, pp 765-767. M Songu, A Kutlu,	The Journal of Laryngology & Otology, Volume 128 Issue 9, pp 768-771. Y-J Wang, W-X Chen, J-L Zhang, F-Y He, Z-F Zhu, Y Zeng, F Yang, S-C Tang,	The Journal of Laryngology & Otology, Volume 128 Issue 2, pp 142-146. S Velthuis, K J van Everdingen, J J Quak, D R Colnot,	The Journal of Laryngology & Otology, Volume 128 Issue 7, pp 599-603. Can audiometric results predict qualitative hearing improvements in bone-anchored hearing aid recipients? M L McNeil, M Gulliver, D P Morris, F M Makki, M Bance,	The Journal of Laryngology & Otology, Volume 128 Issue 1, pp 35-42. K G Effat, N M Madany,	The Journal of Laryngology & Otology, Volume 128 Issue 10, pp 881-884. Does gestational diabetes result in cochlear damage? A Selcuk, H Terzi, U Turkay, A Kale, S Genc,	The Journal of Laryngology & Otology, Volume 128 Issue 11, pp 961-965. J C Wang, S J Allen, A I Rodriguez, C Zahner, S Dissanaike, S Zupancic, J Marchbanks,	The Journal of Laryngology & Otology, Volume 128 Issue 7, pp 604-611. E Kulduk, E Eren, FK Soy, R Dundar, M Aslan, MS Basoglu, F Simsek, H Katilmis,	The Journal of Laryngology & Otology, Volume 128 Issue 10, pp 885-891. A V Kasbekar, N Mullin, C Morrow, A M Youssef, T Kay, T H Lesser,	The Journal of Laryngology & Otology, Volume 128 Issue 11, pp 966-971. B M Heinze, B M Vinck, D W Swanepoel,	The Journal of Laryngology & Otology, Volume 128 Issue 9, pp 772-779. S Dowthwaite, C Szeto, B Wehrli, T Daley, F Whelan, J Franklin, A Nichols, J Yoo, K Fung,	The Journal of Laryngology & Otology, Volume 128 Issue 2, pp 147-152. V Kahya, B Ozucer, R Dogan, A Meric, M Yuksel, O Gedikli, O Ozturan,	The Journal of Laryngology & Otology, Volume 128 Issue 1, pp 43-48. B Saedi, E Razmpa, A Nikjo, M Ghalandarabadi, H Ghadimi, G Saidabadi,	The Journal of Laryngology & Otology, Volume 128 Issue 9, pp 780-783. A Qureishi, G Garas, J Shah, J Birchall,	The Journal of Laryngology & Otology, Volume 128 Issue 1, pp 49-52. G Gowda, S Lakshmi, B G Parasuramalu, C Nagaraj, B V C Gowda, K G Somashekara,	The Journal of Laryngology & Otology, Volume 128 Issue 10, pp 892-896. V Narwani, M Harries,	The Journal of Laryngology & Otology, Volume 128 Issue 2, pp 153-158. A Hussein, A Abousetta,	The Journal of Laryngology & Otology, Volume 128 Issue 7, pp 612-617. A Qureishi, G Garas, A Mallick, D Parker,	The Journal of Laryngology & Otology, Volume 128 Issue 11, pp 972-975. B Saedi, M Aghili, M Motiee, S Valadkhani, A B Niazi, A Safavi,	The Journal of Laryngology & Otology, Volume 128 Issue 9, pp 784-790. N Sethi, P H Tay, A Scally, S Sood,	The Journal of Laryngology & Otology, Volume 128 Issue 2, pp 159-162. H-Y Lin, Y-K Fan, K-C Wu, M-T Shu, C-C Yang, H-C Lin,	The Journal of Laryngology & Otology, Volume 128 Issue 7, pp 618-620. J C Luers, M Ortmann, D Beutner, K B Hüttenbrink,	The Journal of Laryngology & Otology, Volume 128 Issue 10, pp 897-901. X Gu, Z-M Fang, Y Liu, S-L Lin, B Han, R Zhang, X Chen,	The Journal of Laryngology & Otology, Volume 128 Issue 1, pp 53-59. H Li, X Zhang, Y Song, T Wang, G Tan,	The Journal of Laryngology & Otology, Volume 128 Issue 11, pp 976-980. S Genc, M G Genc, I B Arslan, A Selcuk,	The Journal of Laryngology & Otology, Volume 128 Issue 1, pp 60-63. S J Prowse, O Mulla,	The Journal of Laryngology & Otology, Volume 128 Issue 7, pp 621-625. F Bussu, G Pozzoli, V Giglia, D Rizzo, A Limongelli, E De Corso, C Graziani, G Paludetti, P Navarra, G Almadori,	The Journal of Laryngology & Otology, Volume 128 Issue 10, pp 902-908. A Soni-Jaiswal, I Anderco, B N Kumar,	The Journal of Laryngology & Otology, Volume 128 Issue 11, pp 981-985. S Aydin, U Taskin, B Altas, M Erdil, T Senturk, S Celebi, M F Oktay,	The Journal of Laryngology & Otology, Volume 128 Issue 2, pp 163-165. A S Elhamshary, H E Romeh, M F Abdel-Aziz, S M Ragab,	The Journal of Laryngology & Otology, Volume 128 Issue 9, pp 791-796. G Fyrmpas, I Konstantinidis, P Selviaridis, J Constantinidis,	The Journal of Laryngology & Otology, Volume 128 Issue 9, pp 797-802. R Marchese-Ragona, G Ottaviano, S Masiero, C Staffieri, A Martini, A Staffieri, M Mion, G Zaninotto, DA Restivo,	The Journal of Laryngology & Otology, Volume 128 Issue 10, pp 909-913. J Rimmer, C Belk, V J Lund, A Swift, P White,	The Journal of Laryngology & Otology, Volume 128 Issue 7, pp 626-629. P Joshi, S Nair, P Chaturvedi, D Nair, T Shivakumar, A K D'Cruz,	The Journal of Laryngology & Otology, Volume 128 Issue 1, pp 64-67. S Rajan, M Kurien, A K Gupta, S S Mathews, R R Albert, D Tychicus,	The Journal of Laryngology & Otology, Volume 128 Issue 11, pp 986-990. A Hussain, M Shakeel, V Vallamkondu, M Kamel,	The Journal of Laryngology & Otology, Volume 128 Issue 9, pp 803-809. F Villegas-Alvarez, B Pérez-Guillé, R E Soriano-Rosales, M A Jiménez-Bravo-Luna, A Gonzalez-Maciel, S L Elizalde-Velazquez, R Aguirre-Hernández, A Ramos-Morales, R Reynoso-Robles, J F González-Zamora,	The Journal of Laryngology & Otology, Volume 128 Issue 7, pp 630-640. S L Gray, G O'Neill, G McGarry,	The Journal of Laryngology & Otology, Volume 128 Issue 10, pp 914-921. K Otsuka, M Negishi, M Suzuki, T Inagaki, M Yatomi, U Konomi, T Kondo, Y Ogawa,	The Journal of Laryngology & Otology, Volume 128 Issue 1, pp 68-72. 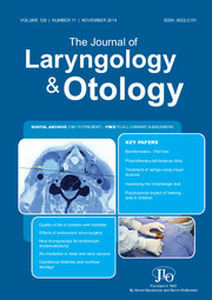 T Yilmaz, N Süslü, M D Bajin, R Ö Günaydin, S Özer, G Atay,	The Journal of Laryngology & Otology, Volume 128 Issue 11, pp 991-995. J Powell, M Reda Elbadawey, I Zammit-Maempel,	The Journal of Laryngology & Otology, Volume 128 Issue 9, pp 810-813. R Varshney, M N Pakdaman, N Sands, M P Hier, L Rochon, M J Black, R J Payne,	The Journal of Laryngology & Otology, Volume 128 Issue 10, pp 922-925. B Elmiyeh, R L Heywood, V M N Prasad, P Chatrath, P Bassett, R Quiney,	The Journal of Laryngology & Otology, Volume 128 Issue 1, pp 73-77. S Mallick, A K Gandhi, N P Joshi, S Pandit, S Bhasker, A Sharma, A Thakar, B K Mohanti,	The Journal of Laryngology & Otology, Volume 128 Issue 11, pp 996-1002. S Pookamala, A Thakar, K Puri, P Singh, R Kumar, S C Sharma,	The Journal of Laryngology & Otology, Volume 128 Issue 7, pp 641-648. N K Nerurkar, T P Banu,	The Journal of Laryngology & Otology, Volume 128 Issue 7, pp 649-653. H Hanakawa, Y Orita, Y Sato, M Takeuchi, S Takao, K Ohno, T Kohno, N Iwaki, H Marunaka, R Tamamura, M Nishibori, H Nagatsuka, K Nishizaki, T Yoshino,	The Journal of Laryngology & Otology, Volume 128 Issue 10, pp 926-931. Does pterygopalatine canal injection with local anaesthetic and adrenaline decrease bleeding during functional endoscopic sinus surgery? C J Valdes, Y Al Badaai, M Bogado, M Samaha,	The Journal of Laryngology & Otology, Volume 128 Issue 9, pp 814-817. N Sethi, P Egan, V M M Ward,	The Journal of Laryngology & Otology, Volume 128 Issue 1, pp 78-81. Y B Mahalingappa, H S Khalil,	The Journal of Laryngology & Otology, Volume 128 Issue 7, pp 654-657. A C Hall, M Simons, G Pilgrim, C Theokli, D Roberts, C Hopkins,	The Journal of Laryngology & Otology, Volume 128 Issue 1, pp 82-85. M H Ozkul, R M Açikalin, H H Balikci, O Bayram, AA Bayram,	The Journal of Laryngology & Otology, Volume 128 Issue 9, pp 818-823. Z B Khuzwayo, T K Naidu,	The Journal of Laryngology & Otology, Volume 128 Issue 1, pp 86-90. M Camacho, R Capasso, S Schendel,	The Journal of Laryngology & Otology, Volume 128 Issue 9, pp 824-830. N P Jordan, H Verma, A Siddiqui, G A Morrison, D P D'Cruz,	The Journal of Laryngology & Otology, Volume 128 Issue 9, pp 831-837. K Yamazaki, H Ohta, R Shodo, H Matsuyama, S Takahashi,	The Journal of Laryngology & Otology, Volume 128 Issue 1, pp 91-95. N Amin, A Pelser, J Weighill,	The Journal of Laryngology & Otology, Volume 128 Issue 2, pp 166-168. P Loizou, N Haloob, E Evgeniou,	The Journal of Laryngology & Otology, Volume 128 Issue 2, pp 169-170. R Crosbie, J Cairney, N Calder,	The Journal of Laryngology & Otology, Volume 128 Issue 2, pp 171-173. P F D Bowles, B Fu, S J Cartwright, S J Watts,	The Journal of Laryngology & Otology, Volume 128 Issue 11, pp 1003-1004. P T Dang, T A Kennedy, S P Gubbels,	The Journal of Laryngology & Otology, Volume 128 Issue 2, pp 174-178. L Cooper, K Ford, R Talwar, M Wareing,	The Journal of Laryngology & Otology, Volume 128 Issue 2, pp 179-181. G van Kerckhoven, A Mert, J A De Ru,	The Journal of Laryngology & Otology, Volume 128 Issue 11, pp 1005-1007. C Smyth, C Jackson, C Smith, R Adair,	The Journal of Laryngology & Otology, Volume 128 Issue 10, pp 932-934. H Tutar, V B Tutar, B Gunduz, Y A Bayazit,	The Journal of Laryngology & Otology, Volume 128 Issue 11, pp 1008-1010. J C L Rodrigues, A Waddell, J-L Cook,	The Journal of Laryngology & Otology, Volume 128 Issue 2, pp 182-184. T Kanazawa, D Komazawa, Y Watanabe, K Ichimura,	The Journal of Laryngology & Otology, Volume 128 Issue 10, pp 935-938. E J Lee, Y J Yoon,	The Journal of Laryngology & Otology, Volume 128 Issue 11, pp 1011-1014. A Ogungbemi, C Dudau, S Morley, T Beale,	The Journal of Laryngology & Otology, Volume 128 Issue 2, pp 185-188. S A C MacKeith, P Sleeman-Barker, J D Ramsden,	The Journal of Laryngology & Otology, Volume 128 Issue 1, pp 96-97. M Diao, F Tian, J Sun,	The Journal of Laryngology & Otology, Volume 128 Issue 11, pp 1015-1017. P W Jenkinson, M I Syed, L Mcclymont,	The Journal of Laryngology & Otology, Volume 128 Issue 9, pp 838-840. S J Kilty,	The Journal of Laryngology & Otology, Volume 128 Issue 2, pp 189-191. M Kato, N Katayama, S Naganawa, T Nakashima,	The Journal of Laryngology & Otology, Volume 128 Issue 2, pp 192-194. A Hariri, N Choudhury, H A Saleh,	The Journal of Laryngology & Otology, Volume 128 Issue 11, pp 1018-1021. F Zawawi, R Varshney, M D Schloss,	The Journal of Laryngology & Otology, Volume 128 Issue 1, pp 98-100. A Hay, B A Ozdemir, Y Soon, L Pitkin,	The Journal of Laryngology & Otology, Volume 128 Issue 2, pp 195-198. L D'Ascanio, E Rebuffini,	The Journal of Laryngology & Otology, Volume 128 Issue 1, pp 101-103. H-T Wong, C-Y Ho, A R Nazarina, N Prepageran,	The Journal of Laryngology & Otology, Volume 128 Issue 11, pp 1022-1023. C-C Wang, C-H Wu,	The Journal of Laryngology & Otology, Volume 128 Issue 2, pp 199-202. L Jablenska, A Trinidade, V Meranagri, P Kothari,	The Journal of Laryngology & Otology, Volume 128 Issue 1, pp 104-106. C-F Yeh, T-L Lee,	The Journal of Laryngology & Otology, Volume 128 Issue 1, pp 107-109. P Kand, S Basu,	The Journal of Laryngology & Otology, Volume 128 Issue 2, pp 203-208. B Ling, D Novakovic, L Sulica,	The Journal of Laryngology & Otology, Volume 128 Issue 2, pp 209-211. E M Farrar, J E H Bates, S Bitetti, I A Bruce,	The Journal of Laryngology & Otology, Volume 128 Issue 2, pp 212-215. E Varol, M Ozaydin,	The Journal of Laryngology & Otology, Volume 128 Issue 2, p 216. S Balta, M Demir, E Kurtoglu, S Demirkol,	The Journal of Laryngology & Otology, Volume 128 Issue 2, pp 217-218. M Sagit, M Kavugudurmaz, S Guler, M Somdas,	The Journal of Laryngology & Otology, Volume 128 Issue 2, pp 216-217. Y Zhang, K Y Li, C Jin, Y T Wang, L Geng, Y J Sun, H C Tian, J Q Liu, X J Jin,	The Journal of Laryngology & Otology, Volume 128 Issue 11, p 1026. Elfy B Chevretton, Sherif Haikel, Ann Sandison, Steve Connor, Ata Siddiqui,	The Journal of Laryngology & Otology, Volume 128 Issue 11, pp -.